All natural. All organic. 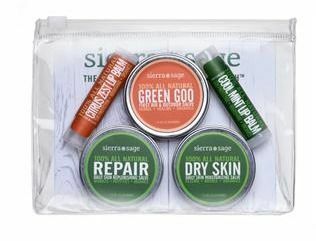 This handy Everyday Travel Pack by our friends at Sierra Sage has a sampling of their great products that are perfect for the on-the-go TrailblazerGirl. Lip balms and Dry Skin Care have a special combination of organic oils including Calendula Flowers which are known for their anti-inflammatory and healing properties, making them ideal for dry winter, chapped lips and skin. While their Repair Salve and Green Goo are all-purpose wonders that take care of everything from itchy insect bites to relieving sunburn to getting rid of dark circles and sun spots. All this in travel-ready sizes that are perfect for throwing in your backpack for a daytrip on your next TrailblazerGirl adventure. As they say, “Pure. Simple. Organic.”.